On the national US record release tour for her new album "Gemini II,"singer-songwriter Johanna Warren is blending her musical path with herpassion for herbalism. On her recent "Plant Medicine Tour," she aligned with local herbalists, farmers and activists in every city she visited to share about their work, sell their medicines and connect with their communities. • passionflower- passiflora incarnata is the only medicinal variety..
• monotropa uniflora is used incredibly sparingly..
• headache that has to do with the liver with pain behind the eyes- chinese medicine perspective..
• using hypericum perforatum for symptoms of Lyme..
• not recommended for anyone to be gluten free that is not celiacs..
• copperhead snake bite and options for herbs to relieve inflammation..
• why not to get a mammogram..
• creating a sacred time when bleeding can stop cramping- antispasmodic herbs..
Susun answers 90 minutes of herbal health questions followed by a 30 minute interview with Plant Medicine Singer Johanna Warren . 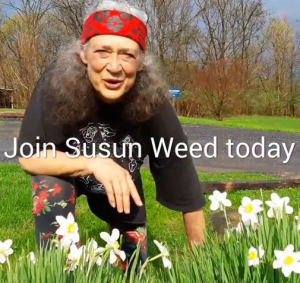 Join Susun Tonight for a Teleseminar, Monday, 6/25/18, at 9:00pm Eastern. Join internationally renowned author, speaker and grandmother voice of the Wise Woman tradition Susun S. Weed and her Naturopathic NinjaWench former apprentice Dr. Ada-Belinda DancingLion for what promises to be a rich, original and helpful discussion on all natural methods on the proper care and feeding of "Down There." Susun answers 90 minutes of herbal health questions followed by a 30 minute interview with Mythic Medicine Amber Hill .